Columbus Luxury King Quilt Set by VHC Brands - P.C. Fallon Co. This Columbus luxury king quilt set includes one luxury king quilt, one king bedskirt and two king shams. The luxury king quilt measures measures 120"W x 105"L. The ruffled burlap bedskirt measures 78" x 80" with a 16" drop. The king shams each measure 21" x 37" and do not include a pillow insert. 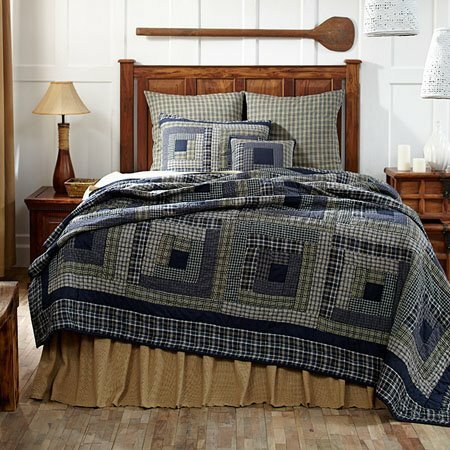 The quilt features a patchwork log cabin pattern in a variety of green and navy blue plaid fabrics. These items are imported. Please note, colors may appear differently in different resolutions and on different computers. Machine wash, gentle cycle. From The Victorian Heart Collection made by VHC Brands.